Batman's rouge gallery. The defining point of 'What franchise is bigger Superman or Batman? ', most of the heavy-hitters who have contended with the 'Dark Knight' are global icons in their own right. While many charts counting down whom is best often end with The Joker, for me I'm not sold. Sure, Joker is one of comics' all-time greatest creations and would be regardless of where he debuted, but I don't think he's numero uno. 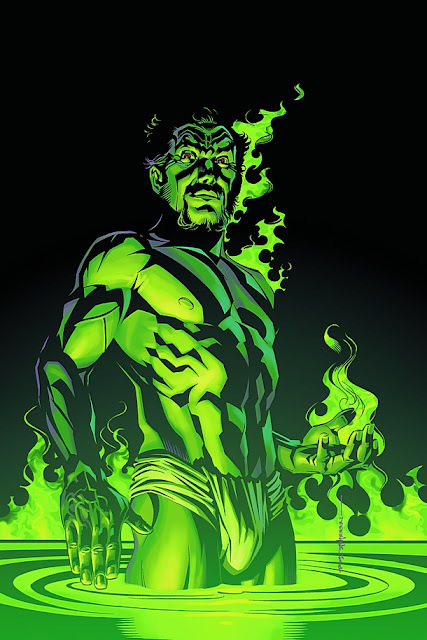 Who: When Alfred the butler 'died' only to be revived by a mad scientist, he was turned into The Outsider. Pasty white and telekinetic, he thirsted to destroy his former masters, Batman and Robin. Why He's #10: I first saw The Outsider in DC Comics Presents #83 and was instantly hooked. If the Jekyll and Hyde transformation of Bruce Wayne's most trusted friend could see The Outsider retain all Alfred's knowledge, then the DCU would have a new reason to fear. 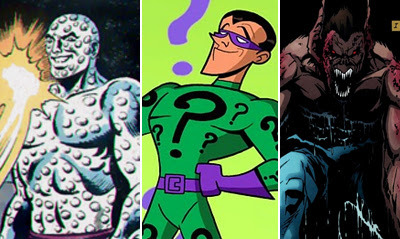 Who: Edward Nigma and his question mark cane baffle Gotham with crimes held together with a series of riddles, designed to highlight his mind as Gotham's cleverest cranium. Why He's #9: Riddler is my personal favourite. Not only is his name E. Nigma a stroke of genius, the riddles he lays down always make for an interactive adventure that you at home can play along with. Comics need stories like that. Who: Transformed into the awesome visual that is Man-Bat after a serum designed to replace his deafness with sonar backfired, Dr Kirk Langstrom is more than just a title swap creation. Why He's #8: Because he's a freakin man-bat, that's why! Forget your Twilight werewolves and the rest, Batman vs Man-Bat is all you need. Who: Trapped in an ice suit after attempting to cure his cryogenically frozen wife Nora, Dr. Victor Fries commits crimes to revive his beloved, turning Gotham into the icy place his heart has become in the process. Why He's #7: The above sympathy-inducing revamp by Batman: The Animated Series doesn't get enough credit. A cold hearted rouge turned tragic love story, Freeze is a mirror image of what Bruce's heart borders on becoming, in the wake of witnessing his parents murder. Who: While the second Ventriloquist, Peyton Riley, had an interesting sweetheart relationship with the Scarface dummy, no one beats Arnold Wesker. A mild-mannered man who is 'allegedly' under the influence of his crime boss puppet, executing his deadly criminal plans. Why He's #6: I love the ambiguity of the character. You're never 100% sure if Arnold is actually under control of the dummy or if it just gives release to his inner demons. Sure in the 'real world' only one answer is plausible, but this is Gotham - anything can happen. Who: Really? The Joker is the ultimate insanity. Chaos for the sake of a punchline only he sometimes understands, he is Batman's most infamous adversary and evil reflection. Why He's #5: Best with a mallet, Joker's black humour can split your sides. However, when the plan behind his gags is laid out in full, the true nature of the character comes out, promising to do even more. For the top four left in the pack, click here. Who: A master of mind control and lover of lunacy, derived by Lewis Carroll's Alice In Wonderland, Jervis Tech uses the themes of the iconic classic to carry out his twisted deeds. Why He's #5: Whoever thought of permentantly linking Gotham with Wonderland needs a medal. The Mad Hatter illustrates the two franchises sit eerily well together, with each highlighting a twisted side to the other, not so obvious when read on their own. 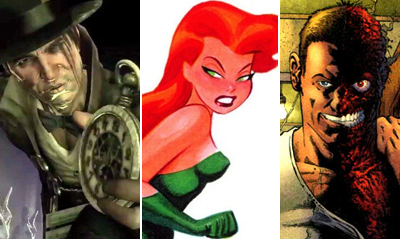 Who: Pamela Isley is a botanist who has placed her love of plantlife above her affection for the human race. Able to communicate and control plants at whim, she is a force of nature best kept behind bars. 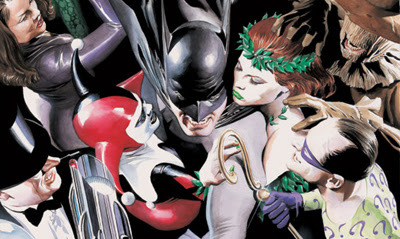 Why She's #3: For Poison Ivy, Batman: The Animated Series is my yard stick. Able to picture real life 'greenies' with a simillar bent, this red-headed eco-nutcase's danger level is only increased by her sultriness and and sinister knowledge of science. Who: The scared remains of D.A. Harvey Dent, Two-Face commits double-edged crimes exposing the duality of the people and morals of the world around him. Dent's own moral compass removed, he now makes most of his decisions on the flip of a coin. Who: 'The Demon's Head' in Arabic, Ra's is out to stop mankinds monstrative effects on the planet by any means nessessary. Kept alive for centuries by the restorative powers of the Lazarus Pits, he has a global network - The League of Assassins - to back up his plans, along with Talia, his daughter and mother of Batman's lovechild Damian, the current Robin. Why He's #1: How can a head of a league of ninja not take the top spot? Ra's is DC's Magneto. He's the villian whose motives you can empathise with, but one of the few bat rouges where operating on a scale bigger than Gotham hasn't spelt their downfall. Backed by his family tree and knowledge of Batman's secret identity, there is nothing hotter then a sandswept skyline, one where Bruce Wayne is about to duel with his nutter of a could've been father-in-law. What do you think? 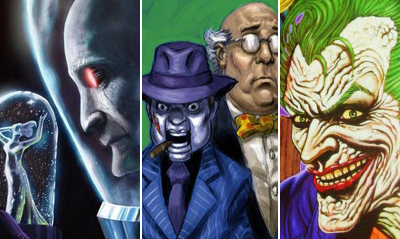 Who are your Top 10 bat-villains? I think Ra's at number one is a good choice. Although I'm not sure he could ever beat out the Joker for me...he's the only one a person could make a serious case for. I think there was always something more scary about the Joker for me, especially after reading "The Killing Joke". I've been reading old Batman giants this last week so I want to vote for the Penguin. I don't know that I ever need to read another Joker story but I'd be happy if someone brought back Simon the Perfidious Pieman from the 60s cartoons. Thanks for the comments Random and Dougie! When I first read "The Killing Joke" Random, I checked the end was actually the end. I couldn't believe Batgirl was over - at the time she was one of the best DCU stars! Anything or one else, including the iconic cover, just came second. Dougie, Penguin is my Mother's top choice to, and pretty much based on his likeness from the same era, so great minds think alike. I'm surprised Grant Morrison hasn't returned Simon. He seems to have dived head first into all the other forgotten rouges of that era. Still who knows what the new DC52 will throw our way!